To install additional software through Windows Server 2012 R2 WDS: wrap your software deployment in a PowerShell script and put it as a Synchronous FirstLogonCommands to your ImageUnattend.xml file, created with Windows System Image Manager (WSIM). Or run your PowerShell script manually as a post-installation thingy. Install software packages during a Windows Deployment Services (WDS) deployment, without Microsoft Deployment Workbench (available in the Microsoft Deployment Toolkit, or MDT). For some, the Microsoft Deployment Workbench (available in the Microsoft Deployment Toolkit, or MDT) is a bless. It was for me too, but I’ve always disliked the slow interface. So when I got the opportunity to set up a new Windows Server 2012 R2 deployment server, with WDS, I decided to try to stay away from using the Deployment Workbench. For as far as I can tell, it succeeded pretty well. Once you have your WDSClientUnattend.xml and ImageUnattend.xml configured the way you want them to be (e.g, they work), you can start messing around with them using Windows System Image Manager (WSIM). Don’t forget to make a backup. Like I said in the beginning of this article, I want to deploy a standardized set of software to newly installed and deployed workstations, and I don’t want to use MDT (neither a deployment through Group Policy Objects, or GPO). On a side note: How do you like and use WDS and MDT for your deployments? Share your thoughts in a comment, thanks! Hé kewl, silent installation parameters?! Where did you find these? 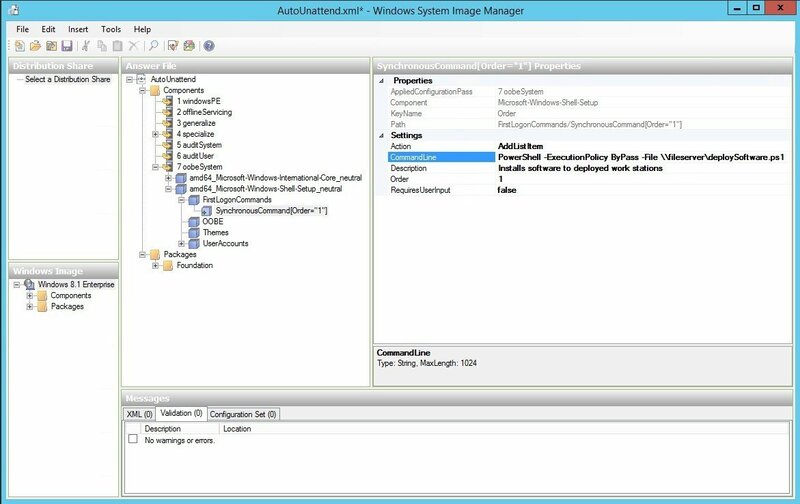 Back in 2012 I wrote an article about silent installation switches to use with WDS/MDT. Most of them are in that article and are still valid, go check them out. As you can imagine, test driving a lot of installations and deployments, I thought it was better to not to have to type the deploySoftware.ps1 PowerShell command anymore. So I looked further. In our Microsoft courses, we’ve learned that in the WDS oobeSystem (or Out Of Box Experience) configuration pass, settings are applied before the “Windows Welcome” message starts. Some options usually used are language or creating user accounts. To me, utilizing the WDS oobeSystem sounded ideal for deploying software during an installation. The component Microsoft-Windows-Shell-Setup contains elements and settings that control how the Windows operating system shell is installed on a destination computer. It also contains FirstLogonCommands. FirstLogonCommands specifies commands to run the first time a user logs on to the computer. These commands run only once. Long story short, just add your deploySoftware.ps1 script as a FirstLogonCommands in your ImageUnattend.xml file. I hope you liked this article. I haven’t found many online references for using FirstLogonCommands to deploy software during a WDS deployment of Windows 7, 8 or Windows 8.1. Certain tasks, sequences and hooks might be better (smoother, faster) when used in Windows Deployment Toolkit, but I didn’t really like the Workbench tool. I haven’t deployed Windows 10 through WDS yet or installed any client application through it on W10 yet, so I can’t really help you on that. But I can imagine it hasn’t changed a lot since Server 2012 and Windows 8.1. Microsoft has a lot of information about the top, see for example https://docs.microsoft.com/en-us/windows/deployment/windows-10-poc-mdt and https://docs.microsoft.com/en-us/windows/deployment/deploy-windows-mdt/deploy-a-windows-10-image-using-mdt. Nice article , now my total auto deploy is finished. Just embarking on this using WDS with W10. I have 90 new PCs at our school to do. I have just got as far as joining the domain. Now need to do some initial installs esp Office and Symantec, and your solutions looks good. Don’t want to have to learn MDT – looks a bit OTT for our environment. Any last breaking news for W10? I need to add support for en-NZ. Hoping that LPKsetup may do the biz.